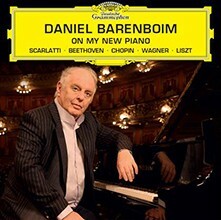 Daniel Barenboim’s first solo recording on the remarkable new concert grand Barenboim-Maene which he developed in collaboration with instrument maker Chris Maene. Conceived and commissioned by Barenboim himself, the new piano was developed and built by esteemed Belgian instrument maker Chris Maene, with support from Steinway & Sons. Barenboim was inspired to create a new piano after playing Franz Liszt’s restored grand piano during a trip to Siena in September 2011. Struck by the vital differences in sound of an instrument constructed with straight, parallel strings rather than the diagonal crossed ones of a contemporary instrument, he set out to create a brand new instrument that combines the best of the old and the new and offers a real alternative for pianists and music-lovers in the 21st century. There are only two Barenboim-Maene in the world. Daniel Barenboim will play selected pieces of the album repertoire on his new piano during his upcoming European recital tour.